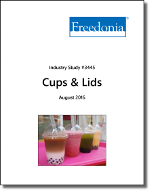 Demand for cups and lids in the US is projected to expand 3.9 percent per year to $10.6 billion in 2020, driven by above average gains for food packaging cups and continued growth for foodservice revenues. Gains will also be supported by food trends that favor convenience and smaller portions. Unit demand will be helped by the growing focus on specialty beverages among foodservice operators and the expansion of food menus to include soup, oatmeal, and other sides. Preference for premium coffee and fruit beverages will also bolster value gains as these drinks typically use more expensive cups and lids to accommodate whipped toppings or showcase the beverage’s color. Companies mentioned include New WinCup, Letica, Fabri-Kal, Newell Brands (via Waddington Group), Wihuri (via Winpak), Pattison Group (via Genpak), and Silgan.